Fredrick D. Peters of Reading, passed away peacefully at home, surrounded by his loving family on Friday, May 18, 2018, at age 95. Fredrick is the beloved husband of the late Alice (Moore) Peters. He is the devoted father of Patti and her husband Vito, Kenny and his wife Stacey, Stephen, Brad and his wife Kuk Kai. The cherished grandfather of Sarah, Jessica, Shannon, Amanda, Nathaniel, Timmy, Stephanie, Zachary and Danny, Fredrick is the loving great-grandfather of 7. He is the dear brother of Dan, Gertrude, and Leona. Fredrick is the son of the late Fredrick Peters and Elvira (Tharp) Peters. He is also survived by many loving nieces and nephews. A native of Oklahoma, Fred Peters attended art schools in Oklahoma and Minnesota. 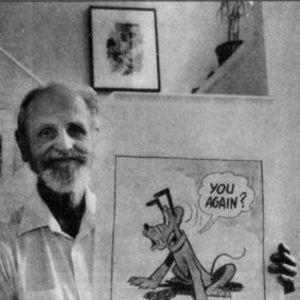 He was drawn into illustration as a young boy, sketching some of his favorite cartoon strips, such as Prince Valient, Flash Gordon, and Batman. He would buy stacks of what he called “big-little books,” detailing the superhero’s adventures. Commenting on his time as a student, Peters said he was “probably more interested in sketching than doing homework” when he was in school. In his mid-20’s, after trekking out to California looking for work, he met with Disney Studios, armed with illustrations and landed a job on the spot. Remembering his time at The Disney Studio, he commented that “it was one of the best places” he had ever worked. Over the years he spent at Disney in the 1940s, he helped animate more than a hundred Pluto shorts. Even though Mickey Mouse’s dog, Pluto was what he spent 90 percent of his time on, he also contributed to Jiminy Cricket, Bambi and special effects, such as illustrating water cascading down a fall, or putting finishing touches to other films. Whenever the animators weren’t drawing, Disney himself encouraged the employees to indulge in a game of ping-pong, baseball or a walk around the studio. “There was always lots to do, and he wanted everyone to call him Walt” Peters had said. More than 60 years have passed since he sat in the Disney Studio in Burbank, CA, but in a couple of swift strokes, the 95-year-old can still piece together a picture-perfect Pluto. Peters left Burbank to run his own studio in New York with a friend. However, the plan didn’t pan out, and instead, he ended doing comic strips, animated television commercials, and color slides. Eventually working for “MAD” comics. After some time in NY, he headed towards Boston, where he settled down with his wife Alice and their four children, Steve, Patti, Brad and Kenny. Fred ended up landing a job at the Boston Globe, where he remained for the next for 32 years, illustrating the Word Wizard and Electric Company comic strips. During his time at the Globe, he also dabbled in freelance commercial art, illustrating ads and brochures for companies. After retirement from the Globe, he became a member of several art associations throughout MA, NH, and FL, including a charter member of The Reading Art Association. His work was and still is, represented in numerous states throughout the country, even as far away as Canada. Many of his talents have received awards and accolades throughout the years. During his years of retirement, he conducted classes in FL, NH, and MA, for many students wanting to learn the wonderful world of watercolor painting. Family and friends are cordially invited to gather and share memories with his Family on Tuesday, May 22, 2018, from 4-8pm in the Doherty – Barile Family Funeral Home, 11 Linden St. READING.